When I was searching for a way to use up my leftover pumpkin, I felt pretty overwhelmed with all of my options. I wanted to try something more novel than bread or muffins, and chose to steer clear of chocolate since I had just gotten a full dose of pumpkin/chocolate deliciousness. Enter the whoopie pie. A whoopie pie is a cake-like sandwich cookie with a creamy filling (in this case, cream cheese frosting). I had never had one before, so I don't have much to compare it to, but these were most definitely worthy of the name whoopie! They were also incredibly easy to make, and made me extra happy because I got to use Baked, my new favorite cookbook, again. I've never really embraced the warm, pumpkin-y, cinnamon-y flavors of Fall (they make me feel bitter that summer's over), but I'm coming around in a major way. Fall just might be my new favorite. 1. Preheat oven to 350 degrees. Line two baking sheets with parchment paper or a nonstick baking mat; set aside. 2. In a medium bowl, whisk together flour, salt, baking powder, baking soda, and pumpkin pie spice; set aside. In a large bowl, whisk together brown sugar and oil until well combined. Add pumpkin puree and whisk until combined. Add eggs and vanilla and whisk until well combined. Sprinkle flour mixture over pumpkin mixture and whisk until fully incorporated. 5. Assemble the whoopie pies: Line a baking sheet with parchment paper and set aside. Using a small ice cream scoop or tablespoon, place a large dollop of filling on the flat side of half of the cookies. Sandwich with remaining cookies, pressing down slightly so that the filling spreads to the edge of the cookies. Transfer to prepared baking sheet and cover with plastic wrap. Refrigerate at least 30 minutes before serving and up to 3 days. Oh yum! I'm actually making some of these very soon... I've had a recipe in the Henrietta's Table (local restaurant) cookbook flagged for about a month now. I'm glad you're coming around to loving fall... it's my favorite, for sure! These look so yummy! I'm planning to bake some this weekend to share with my family. I also have a great family recipe (did you know whoopie pies are a Pennsylvania Amish tradition?) for chocolate pies with whipped icing. I'll share it sometime! whoopie pies are the new thing. cupcakes are so yesterday! These look way too delicious. A killer fall treat for sure! I've never had a whoopie pie, but these look so perfect =D. I will definitely have to try these...was going to make the pumpkin chocolate cheesecake bars but decided not too at the last minute as I didn't want something that rich. These sound right up my alley (especially since cream cheese frosting is my fave! )...thanks for sharing! Love it! Such a great idea. Your photo is mouth-watering. wow these look delicious!!!! I am drooling!!! These look so delicious!! I am going to have to make some soon!! Thanks for the recipe!! These look so good! I'm going to have to try these out, you're killing me with all the delicious pumpkin recipes! I just made these last week. So good! But I used Rachael Ray's recipe which was on a much smaller scale. I added cinnamon to the icing too :) I actually just made more last night for company this weekend because they're so good and so quick! Hi! 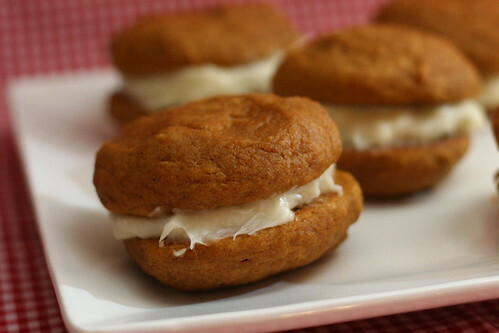 I've linked your post to my Pumpkin Whoopie Pies post. You're welcome to join my cookbook giveaway.